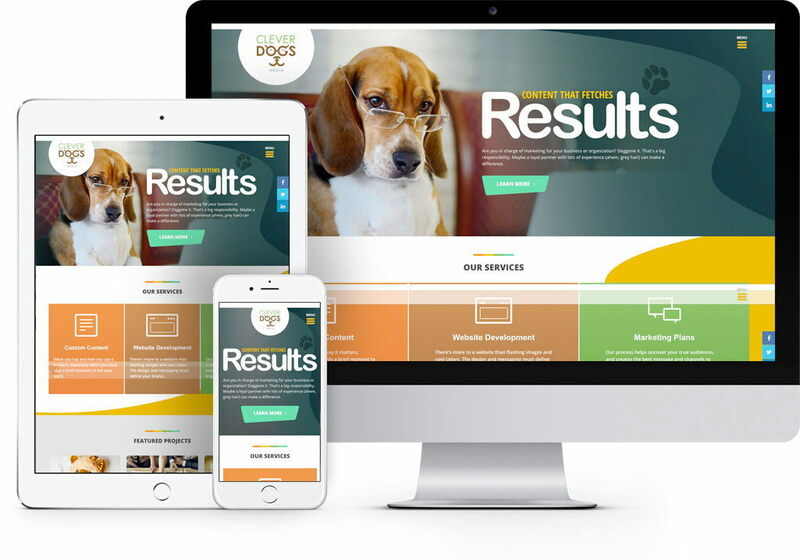 Clever Dogs offers marketing services and a loyal partnership that fetches results. Mojo and Clever Dogs Media work together as strategic partners. Jeff Owen and Sean Miller of Clever Dogs originally met with us to discuss updating their old website, (adapted from Jeff Owen Media's website, before they created the new brand). The more they talked about what they wanted to update, the more we realized they needed a fresh new design. They wanted to update their colors, font, link color, photos, the layout of the content on certain pages, and more. They also wanted to incorporate the new logo, which Mojo also designed. Working together, we realized the content and sitemap did not need to change, so we skipped the blueprint phase and simply redesigned the site and built it. Our Senior Designer at Mojo, Jason Harrop, masterfully took the existing content and laid it out in a way that made more sense and is more visually appealing. SpinWeb redesigned the Clever Dogs logo in 2017, and we were excited for the chance to take the logo and apply it in a new design. The imagery throughout the design and the new logo give the website a fresh, unified design that tells the story of the brand. We switched to an off-canvas menu. Their old traditional menu took users to an interior page where the sub-nav items simply were anchors. It didn't work well and didn't provide an easy way to grow their content. The modern off-canvas menu looks clean, organizes their content nicely, provides the opportunity to grow and is very user-friendly. Clever Dogs new website is a breath of fresh air and stands out among competitor sites. With adorable dog photography and a storyline that is consistent throughout the user experience, the new website is one that you should see for yourself.